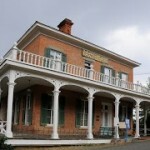 The 1859 Gold Hill Hotel is haunted by some miners who passed away in an accident nearby. Also, former owner William and housekeeper Rosie are said to linger here. William smells like cigar smoke and has dark hair, and redheaded Rosie smells of rosewater perfume. Coins dropping on counter in middle of the night in our room and our real fire in wood burning fire place going completely out and then back into roaring fire before our eyes.